where ω=2*π*f for pusher-mode and ω=-2*π*f for puller-mode. f is rotation rate of magnetic field, t is time. Current passing through the coils are controlled by LabVIEW software by means of Maxon ADS_E 50/5 motor drivers and NI DAQ hardware. Experiments are recorded at 120 FPS with CASIO EX-ZR1000 digital camera. You can find a photo and schematic of the setup below. 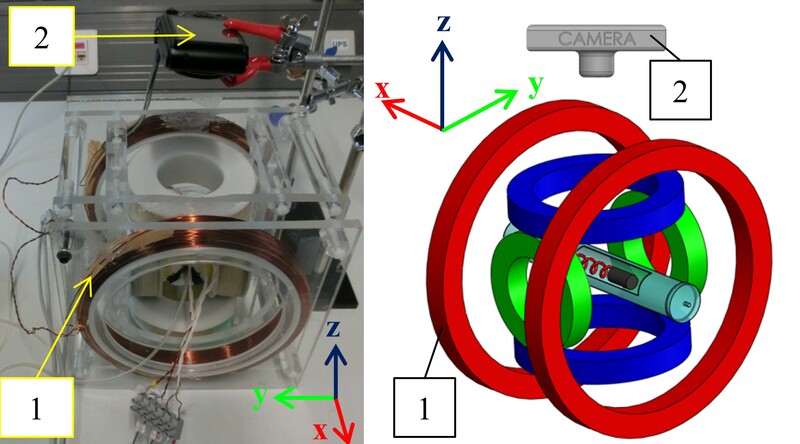 Rotating magnetic field is achieved with the help of two pairs of orthogonal Helmholtz coils. Cylindrical channels made of glass (with a refractive index of ~1.5) are used in the experiments. Experiment recordings are attached below for magnetic field rotation rates of 11-15 Hz both in pusher and puller modes. – sign in file name implies puller mode. The folders the videos are placed in indicate the experiment configuration. Letter D stands for channel diameter, L stands for tail length and Q stands for channel flowrate. You can download the videos individually from the links at the bottom of the page. Processed data of experiment videos reported in the article can be found below. Refer to Readme.txt for information on usage of files. The code package in the link below is composed of 3 MATLAB scripts. image_processing.m script is used for processing experiment videos to extract position and orientation information to .dat files. data_processing.m script evaluates relevant data from generated .dat files and shows the results in various plots. This script also calls image_corr.m function to correct the position information and eliminate the effects of refraction of light. Note: You need Image Processing Toolbox to run image_processing.m. You can find separate download links for each experiment video in Experiment Videos.zip file below.